Ceilings – hull-side mahogany planking – and helm seating with a center pass-through and storage lockers fixed to the aft side of the forward seatbacks were available options on the 1957 23-foot Lyman Runabouts. Her original owners opted for the stripped-down configuration, no ceilings and basic seating. The latter included a wide, solid seatback centered in the helm station with two short hinged wings at each end. Her owners are opting for the upgrades, including a pair of lockers, complete with silhouetted anchors in the doors. Even better, once finished, our optional seating configuration will include a flat floor from stern to firewall, and a small step-up to each helm station seat. We will fabricate and install the ceilings and mock-up the seating and lockers while her owners are on the east coast. Presenting our concept to them in person helps us reach a joint decision, which must translate into a superior results for all. 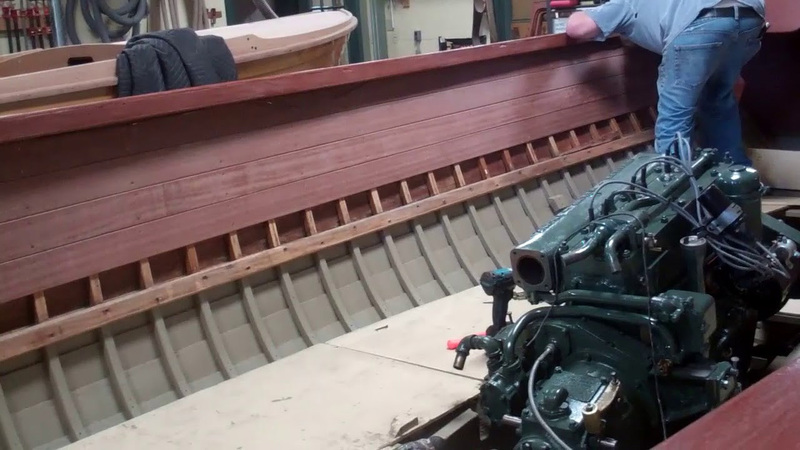 Previous PostPrevious 1959 Chris Craft 17′ Sportsman Engine Install Alignment is Cricital!! !